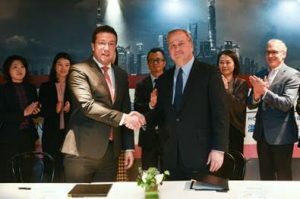 For the second time in a row, Wyndham Hotels & Resorts (WHR) announces that it has become the official Partner Hotel ofITB China, taking place from 15 to 17 May 2019 in Shanghai. 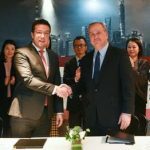 A corresponding agreement was signed on 13 November by Mr. Robert Loewen, Chief Operating Officer Wyndham Hotels & Resorts and Mr. David Axiotis, General Manager ITB China. Wyndham Hotels & Resorts has been an exhibitor of ITB China since its inaugural edition. In 2018, WHR already was the official Partner Hotel of ITB China attracting an unprecedented amount of attention from Chinese travel agents, opinion-leaders and travel trade media with great response and positive feedback. As part of the partnership, more than twenty different hotels from the WHR are anticipated to attend ITB China 2019 showcasing the variety and internationality of the WHR brand and property portfolio. Among others hotels from China, various overseas hotels will be showcasing their services on a large exhibition pavilion on the show floor. During the three-day event the WHR will benefit from several hundred pre-scheduled appointments with travel agencies sending buyers from all over China to Shanghai. As the Partner Hotel the WHR will not only have a broad exposure during the exhibition, but will also be the co-host of ITB China’s official opening event one day prior to the show. Together with the Americas the Chinese market is a key strategic focus of Wyndham Hotels & Resorts’. The recent boom in China’s travel industry drives up the hotel demand resulting in a tremendous market and development potential in China. In implementing the Group’s China strategy of “All-stars, Multi-brands and New Model”, Wyndham’s number of hotels in China has exceeded 1,400 with 140,000 rooms across eleven brands. WHR will continue to invest in China and explore more possibilities in third and fourth-tier cities. Besides that, Wyndham Hotels & Resorts plans to expand their footprint to Hong Kong, Macao and Taiwan and thereby better positioning itself for the sustained growth of Wyndham Hotels & Resorts across Greater China.